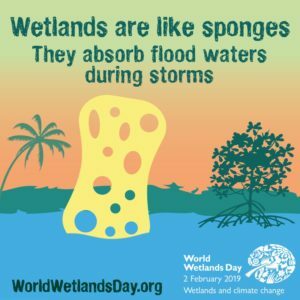 To many people in the U.S., February 2 is Groundhog Day, but is is also World Wetlands Day. This day marks the date of the adoption of the Convention on Wetlands on February 2, 1971, in the Iranian city of Ramsar. Since 1997, the Ramsar Secretariat provides outreach materials to help raise public awareness about the importance and value of wetlands. The 2019 theme is Wetlands and Climate Change. Wetlands buffer coastlines from extreme weather. Wetlands reduce floods and relieve droughts Inland wetlands such as flood plains, rivers, lakes and swamps function like sponges, absorbing and storing excess rainfall and reducing flood surges. Wetlands naturally absorb and store carbon. When drained or burned for agriculture (as wetlands often are) they go from being a carbon sink to a carbon source, releasing into the atmosphere centuries of stored carbon. CO2 emissions from drained and burned peatlands equate to 10% of all annual fossil fuel emissions.